Knowledge Direct MED for continuing education, Maintenance of Certification, SEP, and professional development. 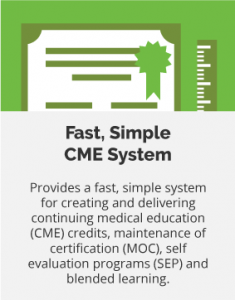 The Knowledge Direct Medical LMS is a centralized, unified, easy to use eLearning platform. Easily integrate with your LMS for Single Sign-on, eCommerce sales, and reporting completions and credits. Incorporate live webinar systems and live on-site events and use LMS tools such as tests, course evaluations, and discussion groups. Knowledge Direct MED is a Software as a Service (SaaS) LMS platform that enables non-technical users to quickly develop, deliver, administer, and monitor web-based training. 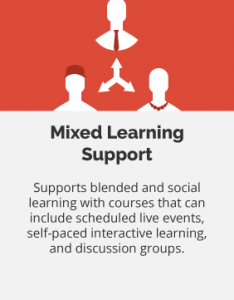 The Knowledge Direct Medical Learning Management System (LMS) allows administrators or instructors to create courses that “blend” live events, interactive self-paced e-Learning, discussion groups, in-person events, and on-site conferences. With the rising cost of travel to attend conferences and instructor-led classes, providing continuing medical education (CME) courses online through the Knowledge Direct LMS is a way that your healthcare association or organization can meet your learners’ continuing education requirements. Using Knowledge Direct is easy, even for non-technical users. 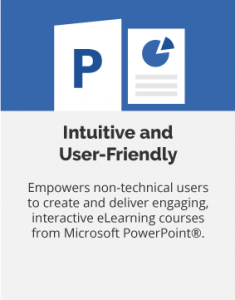 With Knowledge Direct’s built-in rapid content authoring tool, you can quickly build learning objects, modules, and entire online courses using Microsoft PowerPoint or pre-existing materials, such as SCORM compliant content, text documents, pdf files, and video clips. The Knowledge Direct Learning Management System is also SCORM 1.2 conformant. “Easy to Use” is the guiding principle behind Knowledge Direct. There is no learning curve and no technical skills are needed to become proficient in using all areas of the system. 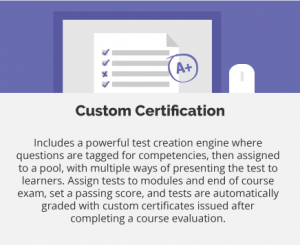 Administrators can quickly develop and post web based training for their learners, and then monitor their progress without the aid of programmers, database administrators, or other technical personnel. Medical reporting features within the Knowledge Direct MED Learning Management System (LMS) are rich and detailed, yet easy-to-use. The system has built-in web reports which export to Microsoft Excel®, Microsoft Word®, and CSV formats. 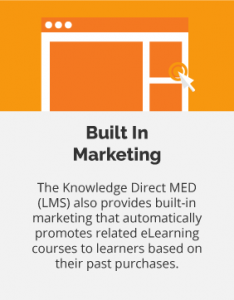 The Knowledge Direct MED Learning Management System (LMS) offers automated student tracking and certificate generation. The Knowledge Direct LMS provides an array of standard reports that enable LMS administrators to quickly view sales activity, course start and completion information, and other data in real time. With the Knowledge Direct MED Learning Management System (LMS), learners gain instant access to electronic copies of their transcripts, right from their training menu, where they can manage their own CMEs. Transcripts, records, and course assessment results can be securely transmitted to accreditation and healthcare certification agencies, like the American Board of Internal Medicine (ABIM) for third-party verification using the Knowledge Direct MED Learning Management System (LMS). 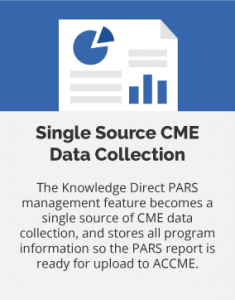 The Knowledge Direct Learning Management System (LMS) can interface with your association management system (AMS) to provide single sign-on, update your association database with members’ test scores and course completions, as well as CMEs earned. 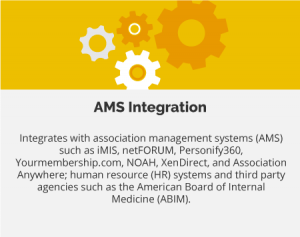 Digitec has integrated Knowledge Direct MED with association management systems (AMS) dozens of times including iMIS, netFORUM, Personify360, Yourmembership, NOAH, and Association Anywhere. Integration is quick and easy with our team of expert programmers. 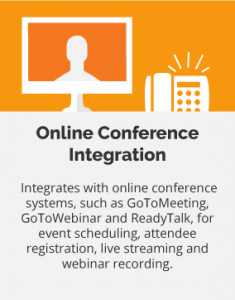 Knowledge Direct also integrates with external systems for processing continuing education credits. The Knowledge Direct Learning Management System (LMS) integrates with an existing shopping cart, so fee-based courses can be sold through your association’s own website. Members log to the member portal and purchase courses, then transition seamlessly to the Knowledge Direct eLearning portal where their learning can begin. The Infectious Diseases Society of America (IDSA), the Association for Professionals in Infection Control and Epidemiology (APIC), and the Emergency Nurses Association (ENA) are just a few of the organizations who have found the Knowledge Direct Medical Learning Management System (LMS) to be the right solution for their continuing medical education (CME) needs. Want to see Knowledge Direct MED in action? Click here to register for free courses from our partner at Bioscientifica.